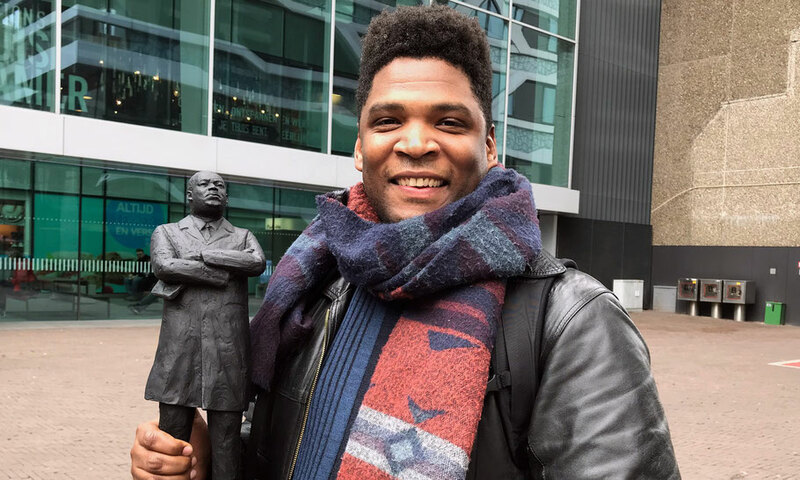 Artist, poet and anti-racism activist Quinsy Gario became famous for his protest against the black face Pete, the racist element in children's event Sinterklaas. Gario was born in Curaçao and studied at Utrecht University. He regularly writes for the magazine for One World, is a graduate of the Master Artistic Research and a BAK fellow. In 2011 he started the art project Black Pete is Racism (Zwarte Piet is Racisme), and he was arrested for wearing a T-shirt with this quote on it, during Sinterklaas & Black Pete's festive entry in the Netherlands. His arrest in 2011 and his attempt to block the permit for the local parade in Amsterdam in 2013 inspired people to mount their own demonstrations in the ensuing years. This lead to more police brutality and scores of unlawful arrests. Gario's attempt to explain why Black Pete is a racist character, resulted in many negative reactions in press and on social media, including (death) threats. Until today the issue of Black Pete hasn't been resolved in the Netherlands, although Amsterdam and other cities decided not to use black face Pete anymore. In stead, colorful & soot smudge Petes are the helpers of Sinterklaas. No single child is complaining about that.